The key to knowing how to teach kids yoga classes is to combine a playful, creative spirit with a lot of patience and, of course, a love of yoga. 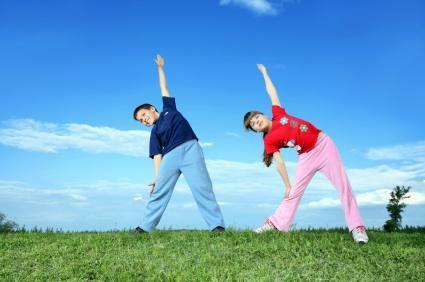 Yoga instructors who enjoy working with children are a natural choice for teaching kids yoga classes. Getting a certification for teaching kid's yoga is the natural first step towards teaching kids yoga classes on a high level. Children are doing yoga for some of the same reasons that adults are doing yoga. In addition to all the benefits of yoga for adults, kids often improve their self-esteem by practicing yoga, which is always a positive result. Many parents sign their kids up for yoga for a combination of reasons, ranging from physical health and body awareness to the social interaction and the discipline gained from an organized class. Kid's yoga is definitely different than yoga classes for adults. If you practice yoga yourself and you sign your child up for a yoga class, don't expect the child's class to closely resemble your own. The secret for understanding how to teach kids yoga classes in a way that keeps children's attention and maintains enthusiasm is to lower the level of self-discipline required and to increase the level of fun, imagination, and creativity. If you are a yoga instructor and are thinking about starting some classes for children, the good news is that you already know all the basics of teaching yoga. You understand the poses, and how to help people achieve those poses without pushing themselves beyond their limits. The next step is learning to adapt these yoga teaching skills to children. While not all studios require you to have a special yoga certification for children, it can never hurt to have this. First of all, you will learn all of the ways that you have to adapt your teaching technique for children and all of the safety precautions that are unique to a classroom with children. Additionally, you will probably be more successful at recruiting students if you are certified to teach children's yoga. Some parents will not notice or appreciate the fact that you are certified; however, for other parents, it could mean the difference between signing their child up for your yoga class versus swimming lessons at a local club. Praise effort profusely; make sure that you praise the children many, many more times than you would in an adult class. This is how children grow. Let the children make shapes together with their bodies instead of only individually; this increases the fun factor, improves self-awareness, and builds an awareness of others. Tone down meditation. Don't take meditation out of the class altogether, but do make it less of a ritual and shorter than you would in an adult class. Tone down relaxation. Yoga movement has more chance of relieving stress for children than relaxing, so introduce them to relaxation poses, but there's no need for it to be a major focus of the class. Introduce games into the yoga classroom. For example, play Simon Says while working on your routine of yoga poses. Make sure the children are familiar enough with the names before you do this so that they don't get anxious about which pose is the right one. With a small repertoire of poses, this game can be a lot of fun. Let the children be Simon after you've done it a few times, and while the children are each having their turn at being Simon, take the opportunity to circulate and praise all of the children on their form and efforts. Teaching kids yoga is fun and inspiring. Enjoy the different atmosphere in the classroom; the kids will bring a breath of fresh air into the studio!